About a month ago I had the idea of launching a podcast about sketchnoting. Podcasting had been on my mind for the past six months or so, but it took me a while to hit on one that felt right. After finding a topic and a format that seemed to fit (a two-times-per-week show about visual note taking and bringing ideas to life), the podcast evolved into something more. Here’s how that evolution took place. After I nailed down the core idea of The Verbal To Visual Podcast, I knew that I wanted that podcast to have a home of its own, so I started working on verbaltovisual.com. In the process of building that site, I came to realize how nice it felt to have a space separate from thegraphicrecorder.com that I could dedicate to the teaching of sketchnoting. So within just a few weeks Verbal To Visual went from a podcast home (with a one-page site) to a full-fledged teaching and learning platform. The Graphic Recorder, Meet Verbal To Visual. Play Nice. What I want to do here in this post is describe the difference between The Graphic Recorder and Verbal To Visual so that you know what is going on in each place and can decide which ones you might like to pay attention to. 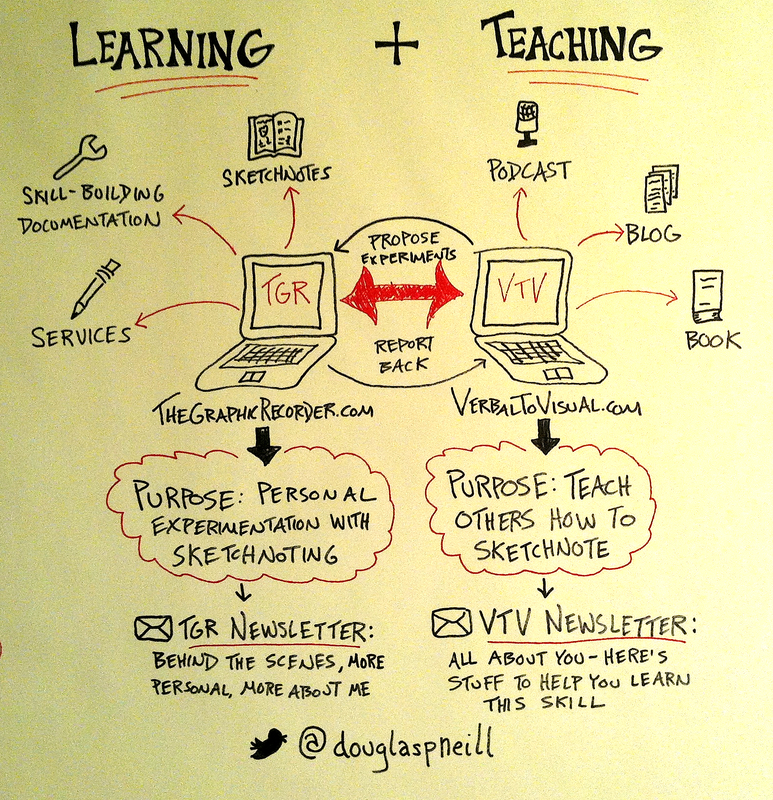 In the simplest way possible: The Graphic Recorder is where I learn; Verbal To Visual is where I teach. Because of that distinction, The Graphic Recorder is more me focused. I’ll be sharing my own skill development, the projects I’m working on, and the sketchnotes that I am taking. Think of The Graphic Recorder as my open-door office and Verbal To Visual as the classroom. Within my office I’m working on my own stuff but enjoy it when folks drop by to say hello. Within the classroom we gather with the expressed purpose of learning a skill. As good teachers do, I hope to make the time spent in the classroom just as fun and engaging as the office chats. I also hope to use The Graphic Recorder as a way to model how you might use your own website to share your progress with visual note taking. There is of course no obligation that you even have a website, but I imagine that many of you do, and if you’d like to share the work you’re doing with the world (either to connect with other sketchnoters or to connect with folks in your field), I’m all for it. What used to be two newsletters is now one! At the birth of Verbal To Visual I gave it its own newsletter, but after a few months of use I realized it makes much more sense to have just one email newsletter, while keeping the two sites themselves separate. So to stay up to date with everything going on here at The Graphic Recorder AND over at Verbal To Visual, sign up for The Verbal To Visual Newsletter to get weekly updates. I’m pretty excited about how this is all coming together – it’s fun to design a site from scratch after tweaking this one bit by bit over the past months. It has also been great to put my teaching hat on again. I had slowly been shifting things in the direction of teaching for a while now, even on this site, but to have a whole new project whose sole focus is on helping others develop the skill of visual note taking feels great. I get to think about things like curriculum design and education psychology, topics that I’ve missed digging into since I stepped away from classroom teaching about a year ago. I’d love to hear what you think about how things are looking over at Verbal To Visual. Since my goal there is to help you as a developing sketchnoter, I will be more than happy to make adjustments as I get feedback from the folks that are using those materials. So if you’ve got a minute, take a look, and let me know what you think with an email to thegraphicrecorder@gmail.com or a tweet to @douglaspneill. I’m looking forward to the continual development of this mostly personal blog here and the teaching and learning platform over at Verbal To Visual.